Why would you want a Speakers Cooler ? Lots of great reasons! 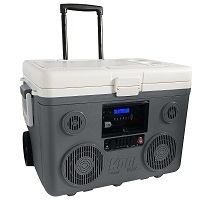 You could take your cooler with speakers along on a Family day at the Park or Picnic on the Beach. They are great for a Bachelor Party. And my daughter's coach brings one to games for her Soccer Team's Pre-game warm up mode (the girls love to warm up to music... and then they grab water after). What do all of these things have in common? All are better with cool drinks and music! Wouldn’t it be nice to have one less thing to carry? These coolers have built in speakers to make carrying your drinks and snacks, lunch or picnic AND music. Some are designed to plug in an MP3 player; others have their stand alone radio… all are fun. These also make great Bachelor Party gifts or reunion Favors. The Coolers come in a variety of sizes and colors, so you can find the one that suits you. And as long as you grab your cooler… you won’t forget your music player. Get a cooler with speakers… make your summer more fun! Who WOULDN’T want a cooler with speakers? 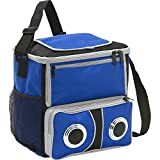 Crazyfire Picnic Cooler Bag with Bluetooth Speaker is best for Outdoor Traveling, camping, picnic. This is made of imported Nylon with Outside pocket zips open-close and headphone jack plugs into MP3 player. This Bluetooth Speaker cooler is waterproof, so you take it anywhere with out any fear. These speakers require four AAA batteries. 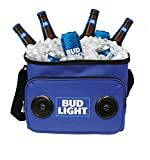 Bud speakers cooler is Compatible with all Bluetooth and non-Bluetooth. You can also enable iPhones, smartphones, Tablets, MP3 Players, CD Players, and More. It also includes a rechargeable battery, so you don’t have to worry about replacing it! Soft cooler bag will keep your lunch and drinks cold when you will go out for enjoyment. You can keep up to 24 standard beer or soda cans in it. 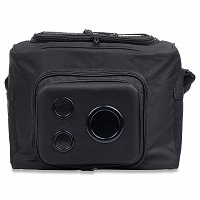 Bellino Cooler is made of 600D Polyester, and it is 12″ wide. Now you can keep your sound connected, and food and beverages cool with this clever cooler. A side mesh pocket and dual front zip pockets hold incidentals. 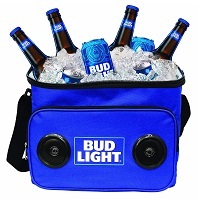 This fully insulated, 24-pack cooler comes complete with speaker. Simply plug in your MP3 player for music anytime, anywhere. The soft sided Beach Picnic 24-pack Sound Cooler with the speaker is great… It fits well into the car without being too rigid. (Have you ever tried to wedge a cooler into the car… next to the soccer bags, chairs, umbrella, beach toys, towels, extra clothes, and shoes? It’s soft sided… And it rolls! A fabulous combination. Because it is narrow, it doesn’t take up as much floor space….however, you might have to dig for stuff at the bottom. A Collapsing Cooler with Music! The Picnic Plus Collapsing Radio Cooler is great for anyone who doesn’t have tons of storage space. 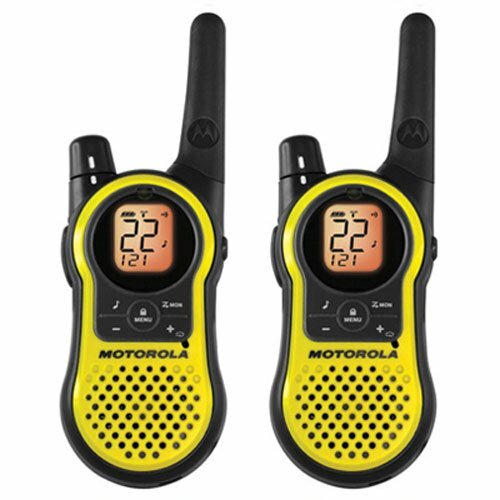 It comes with MP3 and CD jacks, a jack for headphones, and a built in radio (sadly, the radio is a bit like the transistor radios of old). You can fill this baby with 18 cans, and be on your way. This is not a cooler in the traditional … zip up and tote along… sense. This is an insulated party bucket. Fill with ice and your favorite beverages…. plug in your music… and you have a party. Stable legs will keep the drinks at an easy-to-grab level… while the insulation keeps them cool. Perfect for gatherings at home, or in the park. Since this cooler is on wheels, it’s so much easier to take it places while it’s full. A flat or water or a dozen sodas (or a case of beer) can get heavy. What Do You Think About Taking Music to the Park or Beach? Is it Polite to Play Your Music in Public? Is it polite to share your music with others by playing it at the Park or Beach? What Do You Think About Coolers with Speakers?